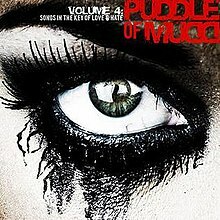 Volume 4: Songs in the Key of Love & Hate is the fifth studio album by American post-grunge band Puddle of Mudd. It was released on December 8, 2009, on Flawless Records. In Spring 2009, the band began recording sessions in Vancouver with Famous producer Brian Howes. Recording in a three part, three week session in Canada initially because of extensive touring duties. Afterwards the band relocated to Hollywood, California for 3 weeks for additional production with producer and engineer Brian Virtue and Come Clean and Life on Display producer John Kurzweg. Their first time together in 6 years. Scantlin commented on production work, "Even though we hate messing with success, we felt adding newcomer Brain Virtue to the producer mix would be a welcome change. What we got is 10 tracks of exactly what we were looking for." The band announced through their MySpace and follow-up interviews in late summer that the album had finished production and was in mixing. Bassist Doug Ardito confirmed only 10 songs to avoid what he called "filler material" and to have new listeners focus more on non-single songs. Around 21 songs were worked on during production, and whittled down to 10 to 12 tracks according to singer Scantlin. Scantlin described the sound as more edgier, punk rock, similar to earlier releases. The record has sold around 100,000 copies in the United States, and the lead single "Spaceship" also sold well over 100,000 copies. Volume 4 was however the band's first album to not produce a Hot 100 hit, and, unlike the previous albums Come Clean, Life on Display and Famous, neither the album sales or any single sales topped 500,000. The album was mixed at Ocean Way Recording. The album was released on December 8, 2009. It debuted at #95 on the Billboard 200. Bill Appelerry – Piano on "Shook up the world"
Stevie Blacke – String engineering and arrangements on "Shook up the world"
^ "FMQB: Radio Industry News, Music Industry Updates, Arbitron Ratings, Music News and more!". Fmqbinsider.com. Archived from the original on 2005-01-28. Retrieved 2012-09-04. ^ "Radio Industry News, Music Industry Updates, Arbitron Ratings, Music News and more!". FMQB. Archived from the original on 2011-07-11. Retrieved 2011-09-14. ^ "About.com review". Rock.about.com. 2009-12-08. Archived from the original on 2011-10-04. Retrieved 2011-09-14. ^ Erlewine, Stephen Thomas. "Review:Volume 4: Songs in the Key of Love & Hate". Allmusic. Retrieved 2009-12-10. ^ "BLARE Magazine review". Blaremagazine.com. 2009-12-07. Retrieved 2011-09-14. ^ "Earsucker review". Earsucker.com. Retrieved 2012-09-04. ^ "The Diamondback review". Diamondbackonline.com. 2009-12-07. Retrieved 2011-09-14. ^ "TuneLab Music review". Tunelab.com. Retrieved 2011-09-14. ^ "New Interview With Puddle Of Mudd's Wes Scantlin | tunelab™". Tunelab.com. Retrieved 2011-09-14. ^ "Puddle of Mudd – Volume 4: Songs In The Key Of Love & Hate + 2009 tour dates". Band Weblogs. 2009-10-26. Retrieved 2011-09-14. ^ "Rock 94 1/2, Spokane's Best Rock. KHTQ-FM Spokane Washington". Rock945.com. Retrieved 2011-09-14. ^ "Audio : AUDIO: Wesley Scantlin from Puddle of Mudd". Qctimes.com. 2009-06-24. Retrieved 2011-09-14. ^ "Puddle of Mudd Mix New Album at Ocean Way Recording". Consumerelectronicsnet.com. 2009-10-30. Retrieved 2011-09-14. ^ "Puddle of Mudd Music News & Info". Billboard.com. Retrieved 2011-09-14. ^ "iTunes - Music - Volume 4: Songs In the Key of Love & Hate (Deluxe Version) by Puddle of Mudd". Ax.itunes.apple.com. 2009-12-08. Retrieved 2011-09-14.